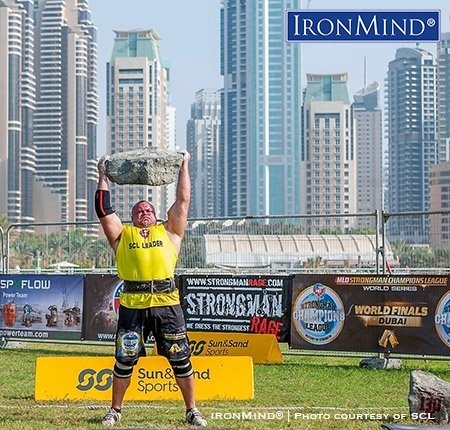 “Dainis Zageris is the new SCL world champion 2016 and dethroned Krzysztof Radzikowski from Poland,” Marcel Mostert reported to IronMind, as last weekend the 16th and final stage of the MLO Strongman Champions League was held in Dubai. “In the city of gold, Latvia’s Dainis ‘Titan’ Zageris swept away his opponents in the final competition of the World Series. 2015 champion Krzysztof Radzikowski got second and Matjaz Belsak took third place. It was a very hard, but also exciting final for all athletes, and since none of them had ever in Dubai, this was an experience as well for them. “Despite the extremely hot weather, the competition in Dubai was full of memorable performances and strong results. 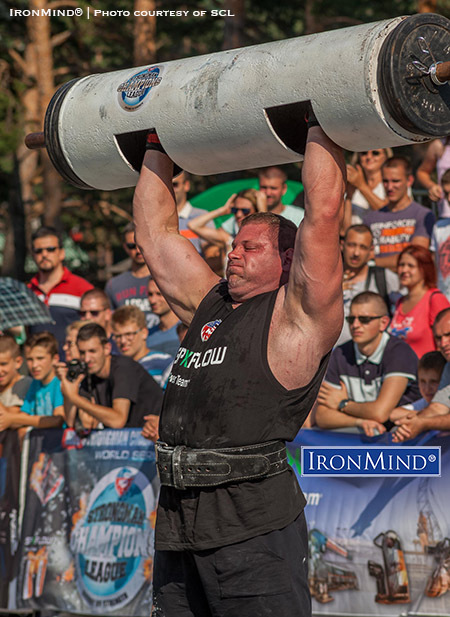 “On Day 1, Krzysztof Radzikowski registered a well-deserved victory in the discipline Car Train Pull, Eric Dawson triumphed in Rock Lift, where the athletes had to lift three stones with different weight (100 kg, 110 kg, 130 kg), and Dainis Zageris finished first in Pole Push, without a single loss in all of his matches. “Day 2 started with Car Dead Lift for reps, an event won by Jean-Francois Caron who made a striking 12 repetitions with a 450-kg weight. Next, Bjorn Solvang had no problems winning his world record discipline, the Front Hold. The last event in the competition, the IronMind Loading Race was won by Matjaz Belsak with his amazing time of 30.52 seconds with 4 bags of 125 Kg to load in pick ups. “Among the cash prizes for all athletes, Dainis Zageris, Radzikowski and Belsak received also products by MLO Nutrition and IronMind. 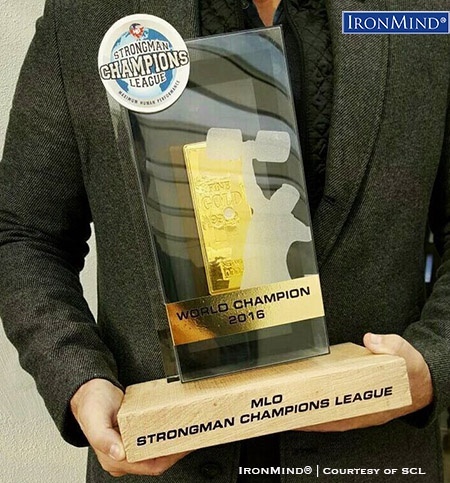 “With new places on the calendar, 1 Kg of gold for the champion besides all the other prize money, over 16 stages, broadcasting in almost 100 countries next year and in its 10th year, the MLO Strongman Champions League can be seen truly as the biggest strongman league in the world. “Kick off for the 2017 MLO Strongman Champions League is 28 January in Norway,” said Mostert. “Finally, The real raw clash for the world title will be this coming weekend 4 and 5 November in Dubai,” Marcel Mostert reported to IronMind. “During the year, more than 100 athletes competed in 15 stages all over the world to gather ranking points in the biggest strongman league of the world, the MLO Strongman Champions League. The 10 best in the ranking, with only 1 per country allowed, will start in the world finals: the SCL leader will start with 10 points in the finals, the number 2 with 9 points, etc. “There is still a chance for these finalists to be the new world champion 2016 and win a bonus of 1 kg gold. 14.30 Deadlift with cars for reps.
“The leader in the MLO Strongman Champions League, Dainis Zageris (aka TITAN), won SCL Portugal last weekend, one 1 point ahead of the “Polish Power” Krzysztof Radzikowki,” Marcel Mostert reported to IronMind. This was a nice reversal of fortunes for Zageris, as he had lost the previous stage, SCL Curacao, by one point. “The new number 1 on the Spanish strongman scene, Roberto Rodriquez, surprised many with a 3rd place overall, on the same points as Matjaz Belsak from Slovenia, Mostert continued. “Roberto even won the first 2 events in this tight and hard battle with 3 equal final placings of other athletes. “Also, there were 2 newcomers where in the SCL Portugal: Topi Ovaska from Finland and Renato Soares from Portugal. They did well and got a great experience, in the old school of Strongman. “The new Finn is a big guy who only needs some more experience, same as Sean O’Hagan , the biggest Strongman in the World, who ended in the top 6 here. “The big Tyre deadlift for reps with 390 kg was also a great event, especially without the power suits, which are banned in SCL now—we still have fantastic results. Dainis Zageris and Krzysztof Radzikowski both made 11 reps, for the win. Many thanks here also to Nuno and Angelina Araujo, who did an outstanding job at by organizing the Power Expo in Porto and the professional Strongman within. “Dainis Zageris is still leading the MLO Strongman champions League, with Matjaz Belsak and Krzysztof Radzikowski following on 2nd and 3rd place, respectively. “It will be a great battle in Dubai, for the finals , where also JF Caron and the strong American Eric Dawson will enter the stage. Keep following us on our website, Facebook and of course on IronMind, who will also be an official sponsor in Dubai,” said Mostert. Not even a brush with Hurricane Matthew could derail MLO Strongman Champions League Curacao, where Jimmy Paquet won the contest and Krzysztof Radzikowksi threw a world record. “Luckily, the hurricane only slammed the beautiful island a little bit, but we were reminded that nature is still stronger than humans, even as our strongman competitors later demonstrated their brute strength on the wonderful beaches of the island. Adding to the excitement, J-F Caron’s training partner, Jimmy Paquet (Canada) plucked the SCL Curacao title from Latvia’s Dainis Zageris, winning by merely one point. Holland’s Alex Moonen was third and Krzysztof Radzikowski finished fourth, overall. “It was a great competition, exciting and really surprising as well,” said Mostert. Especially after the first event, deadlift reps with 355 kg, where Krzysztof and Dainis did 8 and 11 reps, respectively, but Jimmy went over that easily with 14 reps! It was astonishing and exciting,” said Mostert. Adding to the excitement was a new world record in the 14-kg shot put (twice the weight of an Olympic shot put) by Krzysztof Radzikowski, who broke Vytautas Lalas’s mark of 9.40 meters with a put of 10.07 meters. “In the last events, truck pull and loading, it was a heavy fight for the title, and Jimmy finished one point ahead of Dainis. It was a truly great event and atmosphere with a lot of beautiful people to cheer on the athletes, so the MLO Strongman Champions League will certainly returning to the Caribbean next year,” Mostert said. “Keep following our league and let’s see who else gains the last places for the SCL finals and 1 kilo of gold in Dubai soon,” said Mostert. If you want to compete in the MLO Strongman Champions League, you can kiss your powerlifting suits goodbye—they have just been banned, along with double sleeves, double belts and figure-8 lifting straps. 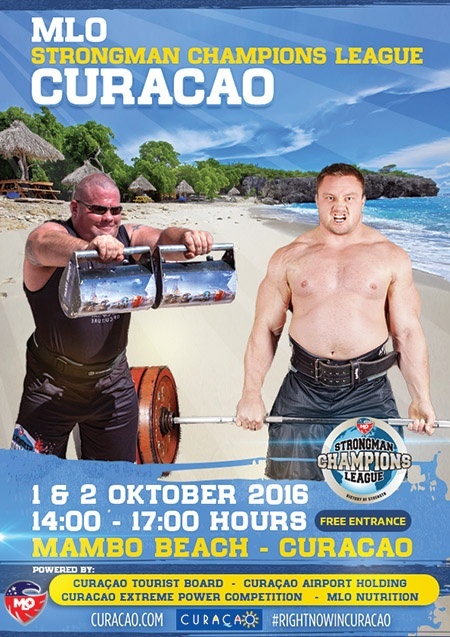 “We are proud to announce our next stage of the MLO Strongman Champions League, coming weekend, 1– 2 October in Curacao,” SCL Director Marcel Mostert told IronMind today. Curacao is a very beautiful, Dutch island in the Caribbean, well known as a holiday paradise, and we have something great planned for the pearl white Mambo beach of Curacao: Boat pulling, loading events, rock lifting, and more. 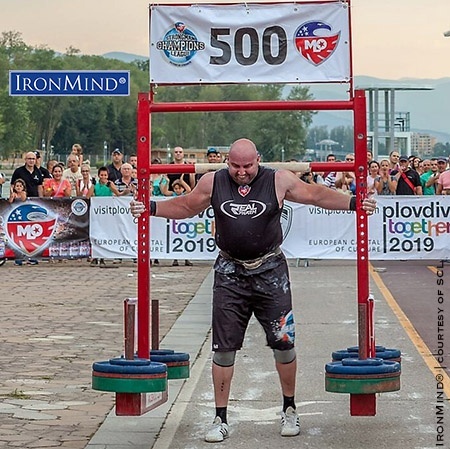 Athletes such as Krzysztof Radzikowski, Dainis Zageris, Holland’s own Alex Noonen, and runner-up in this year’s Canada’s Strongest Man, Jimmy Paquet, along with any more top strongman athletes,” said Mostert. This competition will be a battle not just for the title in Curacao, but also for SCL ranking points going into the 2016 SCL World Championships and season finale—where 1 kg of gold awaits the winner. In more big news, SCL, which has already begun its move to raw strongman by banning double sleeves, double belts and figure-8 lifting straps, is now banning powersuits as well: “Beginning 1 October it will be not allowed anymore in SCL to use a powersuit in deadlifts/Yoke race/and other strongman events,” Mostert told IronMind. Mostert also pointed out that banning these suits will make things much more comfortable for the competitors, especially in sweltering temperatures. “Raw Strongman, showing their muscles and their unbelievable strength at their highest performance: That’s what we want to see and that’s what the world needs to see,” Mostert said. 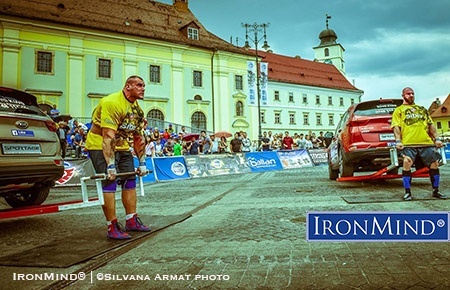 Subiu, Romania hosted the Strongman Champions League Romania last weekend, a two-day, seven-event battle “with lots of spectators, 27-degree [80 F] weather, sunny skies . 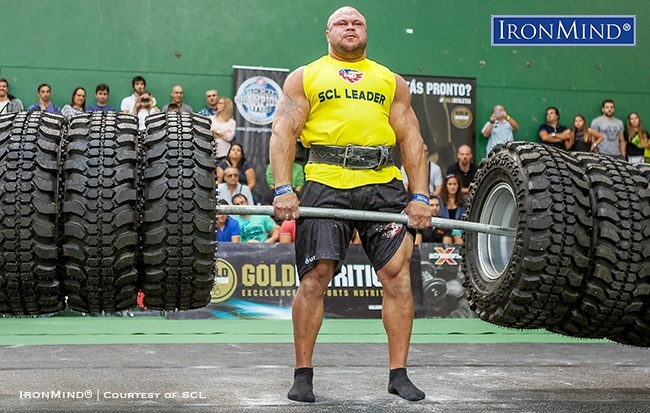 . . a fantastic strongman experience,” SCL Director Marcel Mostert told IronMind. Holland’s Alex Moonen from Holland, reportedly in great shape at the moment, was second, and Martin Wildauer (Austria) finished third overall. Again a stage in the MLO Strongman Champions League with a very successful ending. 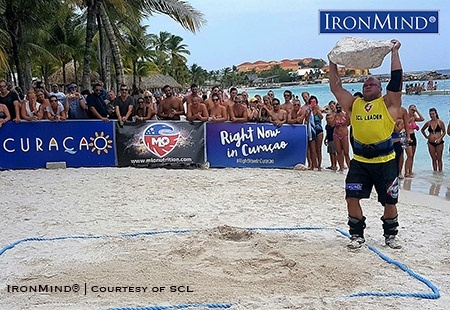 The next stage of the MLO Strongman Champions League will be Curacao, a beautiful and really astonishing place in the Caribbean islands,” Mostert told IronMind. On their sandy white beach there will be some cruel events again, but for the real strongman, this is not a problem. All athletes will fight for more ranking points to get into the finals in Dubai at 4 and 5 November, where 1 kilogram of gold is waiting for the winner. Krzysztof Radzikowski from Poland, the defending World Champion, will be a presence as well, returning to competition following a three-month break due to injury. “It promises to be fireworks again, so stay tuned to IronMind and the SCL website,” said Mostert. “We had the SCL 90kg /105kg World Championships in Kokkola, Finland last weekend,” Ilkka Kinnunen reported to IronMind. A total of 38 athletes from around the world arrived last weekend in Kokkola, Finland to compete in the under 90-kg and under 105-kg MLO SCL World Championships. The competition started on Friday with 3 qualification events in sunny Kokkola central. Around 2500 people gathered to cheer the athletes in Farmer’s Walk, Front Hold & Sack Loading. From each weight class, the top 12 qualified for the finals. The finals started Saturday and again even with few clouds, the stands were full and of course it brought extra energy for the athletes also and of course, Kokkola’s own strongman ,<90 kg Pekka Annala who made it to the finals, was the hometown hero. 1. Aaron Fondry USA, Sami Pätäri Finland, Jake Taylor Australia, Ewan Massie Scotland all equal 350kg result. <90kg Viking Press 120kg for reps.
<105kg Viking Press 140kg for reps. The MLO SCL World Champion in <90kg is Brian Moller Larsen, Denmark and in <105kg Kevin Faires USA. The competition was also excellent for the Finns as in both categories second place stayed in Finland. Specials thanks to Kokkola City and Jouni Kivelä who organised the event in Kokkola. 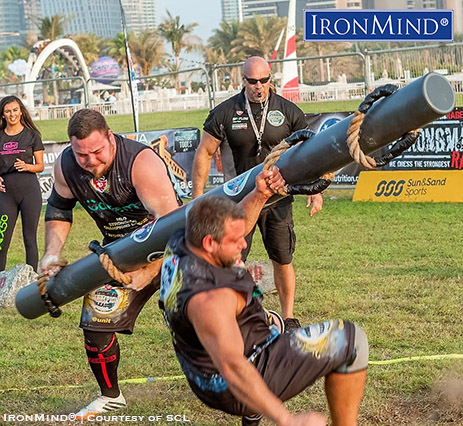 Breaking News: In an official statement released to IronMind this morning, MLO Strongman Champions League (SCL) said, “Today the World’s Strongest League is proud to announce our World Finals will be held in Dubai, November 4–5. “After 16 grueling stages worldwide, the winner will be crowned as the 2016 World Champion and will take home 1 kg of gold with him as the first prize. “10 Finalists with the most points during the year will come to Dubai for the final stage in the 2016 SCL tour and they will fight through 6 heavy strongman events in 2 days. “As a special challenge, the competition will feature a truck pull in the desert—with the heat as your enemy, along with gravity and friction, and we see this as the ultimate extreme test for any sportsman in the world. “The MLO Strongman Champions League is recorded in 16 countries and broadcast in 95 countries all over the world. It is the biggest strongman platform ever and this year’s world championships will bring new luster to what we are doing. “Rising from the Arabian Desert, Dubai is a city born in extremes, and now it will showcase an extreme sport to watch on 4 and 5 November. “‘Veni,Vidi, Vici’ as they say, and Canada’s Simon Bourdeau must have taken it to heart as he came, he saw, and he won his very first SCL competition ever,” Ilkka Kinnunen told IronMind today. “He told us even before that he came for the title—MLO Strongman Champions League Finland,—and would settle for nothing less. “But still, it was really a very tight battle until the end, this last weekend in Vaasa (Finland). In a two-day event with in total 7 disciplines, the Canadian Simon Bourdeau took the victory just one point ahead of the Latvian Aivars Smaukstelis, who won also this year already 2 SCL competitions, and one and half points before the Estonian Lauri Nämi. “The first day in sunny Vaasa brought around four thousand people to watch when the strongmen started their battle in 4 hard events. The first event was Mini Bus pull which was kind of warm up for harder events to come. Winner in first event was the Irish Giant Sean O’Hagan, nearly 200 kg heavy and 212cm [nearly 7 ft.] tall. “In the second event, the Overhead Medley, athletes had to lift two Logs and a Giant Dumbbell of 100 kg at the end. This was also a timed event and the fastest man here was the current Log Lift World Champion, Vidas Blekaitis. Second was Aivars Smaukstelis and Lauri Nämi was third. “In third event, the House Frame Carry and Cross Carry Medley, was a challenge—especially to bring back the 170-kg cross was not easy for the athletes. The winner here was Aivars Smaukstelis. Second was Lauri Nämi and third was Simon Bourdeau. “The last event of the first day was the Forward Hold: Vidas Blekaitis won, the Finnish Viking Antti Mourujärvi was second and and Simon Bourdeau was third. “The second day started in little rain, but it did not scare the public. Before the first event took place the area was again full of cheering people, which is typical in Finland, where the people love strongman. “There were three events on the second day, starting with Hercules Hold with cars. On this event we could clearly see that Simon is one of the best grip people in the world. He was standing easy the longest time, so that is promising for the future, especially when he can compete against Mr. Grip at the moment, Stoyan Todorchev from Bulgaria. Second place here was Antti Mourujärvi and third was the French strongman, Aurelien Le Jeune. “After that, the Deadlift Medley was won by another Finnish athlete, Jarno Kirsela, in one of his best and favorite events. He took the victory over Simon Bourdeau and UK Junior Champion Paul Smith. Paul Smith is only 22 years, but still did the 400-kg deadlift easily. “The Frame Carry and Yoke Medley was the final event and there were three athletes tied at 45 points, chasing Simon who had 3 points more. All very exciting and interesting. Aivars Smaukstelis took first, second was Lauri Nämi and third was Vidas Blekaitis. “This gave the win overall to Simon and Aivars went from third to second place in the end. “The show was really fantastic and exciting , and we look forward to be in Finland again with the MLO Strongman Champions League. “But saying that, in just three weeks’ time we will do the World’s Strongest Man under 90 and 105 kg,” said Kinnunen, who, along with Marcel Mostert, founded the 105-kg strongman category for a 2005 contest in China, as part of an IFSA initiative. 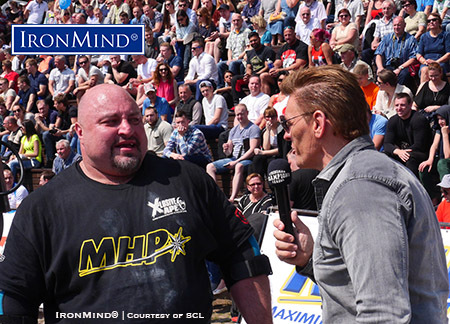 “This year it will be at 9 and 10 September in Kokkola, Finland and it will be televised and broadcast under the MLO Strongman Champions League World Championships, so stay tuned to IronMind for more news,” said Kinnunen. American strongman Eric Dawson is on a roll: he just won his second SCL contest of the 2016 contest. The MLO Strongman Champions League England was won by Eric Dawson, who took his second win in SCL this year. Again a very solid win from Eric, who was on equal points until the last event with Mateusz Baron from Poland. Krzysztof Radzikowski was coaching Mateusz, because Krzysztof himself is still coming back from an injury, and will start to compete again at the SCL Curacao on 1 October. The last event, the Stones of Steel, was death for Mateusz, and he lost even his second place overall to Martin Wildauer from Austria. On that same event, Eric Dawson and Stoyan Todorchev, both made a world record with 183 kg over the bar. This stone is completely from iron, and can’t be touched with tacky or other support, and therefore very difficult. The stone is custom made by Mike Bartos and the previous record was from Martins Lincis, from the USA, with 181 kg. An extra 1000 USD was given for this world record. For Stoyan it was already his fourth world record this year, and he is climbing to place nr 3 in the overall SCL ranking, which leads to the world title 2016. Martin Wildauer took second place overall and Mateusz Baron third. Many thanks we have for Toby George and his team from the Strongman Sanctuary—they are really beautiful people to work with and we hope to see them again next year. 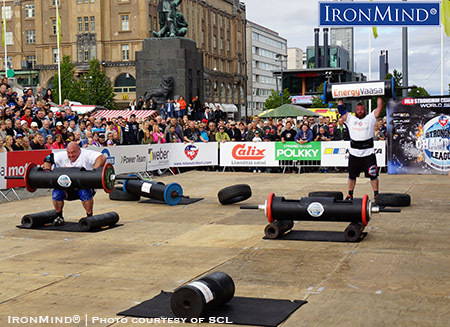 This coming weekend, the MLO Strongman Champions League train arrives in Finland: 21–22 August in Vaasa. We are ready for stage 9 and it will be a 2-day competition, also with 12 strong international athletes. With temperatures of 40 C/104, Bulgarian strongman Stoyan Todorchov blazed to three new world records in from of the hometown crowd filling the arena. In a case of understatement, MLO Strongman Champions League director Marcel Mostert, told IronMind, “Todorov was really strong today FIn an unbelievable hot 40 degrees weather, with a full arena, the Bulgarian Stoyan Todorchev was really strong today as he broke 3 world records and also took the title of the MLO Strongman Champions League Bulgaria. “First he did the farmer’s walk, 400 Kg over 25 meter and broke the distance of Stefan Solvi Pétursson, set at SCL Guinness World records in China this year, and his time 16.65 seconds goes in the books as a new world record, also. “After the second event log lift for reps, he had recovered and Stoyan set a new world record with the Yoke Race for Max with 500 kg, walking 16.50 meter without a drop. “May I say that the man was fired up totally by his own crowd! “This competition was very exciting, because with one event to go, there were still 5 athletes who could win the title, and Stoyan was tied with Matjaz Belsak, but in the end, Stoyan beat Matjaz by one point. Again we did set some new standards here and we invite others try to break them. We recently asked ourselves the question: Are we seeing our beloved strongman sport becoming weak? Diluted by neoprene-encased, gutless Teletubbies? Or can we consider some clear rules and keep it raw, showcasing the real strongest man in the world, who pick up weights, pulls planes and cars, lift logs and stones, without these gimmicks?Because at times we wonder if we are in a strongman competition or at a Muppet show. Well, the Strongman Champions League has now decided, we want raw power, real men, powerful muscles each weight dragging up with a smile. With all due respect, we are finished with excess neoprene, knee and elbow warmers, three belts and deadlift suits all worn at once. It certainly won’t harm if athletes don’t use them. We think it’s the biggest joke in strongman these days.And what’s next? Having titanium attachments to help lift a weight? Putting power knee wraps around the elbows to lift more? We might as well be employing a forklift. Where does this madness end is a question of our athletes and audience.The power that we as Strongman Champions League admire and celebrate is exactly the power that comes from within the body. Therefore we have made some new rules, which can be found on our website. From the 1st of July we have banned all double belts, suits, elbow warmers etc. In all of our events we will allow to have only one elbow warmer at only one arm, one deadlift suit, one belt and normal straps. This also means no figure-eight straps, no high heel boots, or any other gimmicks that undermine the sport’s integrity or puts the athlete at any unnecessary risk. We implemented these new rules last week in the SCL Serbia and they were well received by everybody. Our audience wants to see these extraordinary bodies work in their raw and natural state: our audience wants to see the whole package.So, let us be the new IPF (International Powerlifting Federation) of the strongman sport, and take the lead in these matters, again. We are not afraid of criticism or derision and we are certainly always open to suggestions for the development of our sport.The Strongman Champions League thinks it is clear and simple here: if we all want it so professional, if athletes want to be professional, then you should take it to your audience as well because the audience deserves a great show from the athletes and the athletes deserve the applause. The MLO Strongman Champions League can and will be the referee between these two worlds to continue to evolve and improve our sport. Watch our next stage number 7 in Bulgaria at 23 July, where all the strongmen will be fighting for the title….raw and uncut. 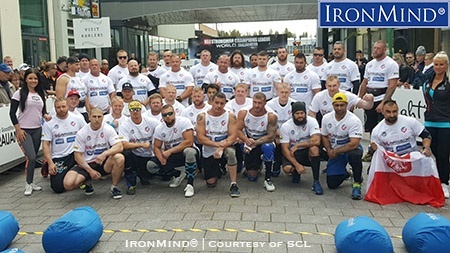 Setting the stage for IronMind, SCL director Marcel Mostert said, “In a very sunny 30 degrees [86 F] atmosphere, deep in the mountains of Serbia, the SCL train stopped in Zlatibor last weekend for stage 6 of the Strongman Champions League (SCL). “The crowd was really great there, enthusiastic until the very end, and the Latvian strongman Aivars Smaukstellis took the title—proving again again that he is very strong, as he just finished in the deadlift 350 kg for reps, with 8 reps, which was just 2 less than Martin (aka The Deadlift Kid) Wildauer,” said Mostert. “Speaking of Martin Wildauer, he got second place overall, and Matjaz Belsak took the third place, overall. “The Icelander Stefan Solvi Petursson showed his power by winning the Framewalk, 340 kg over 40 meters in 20.67 seconds, and took fourth overall. 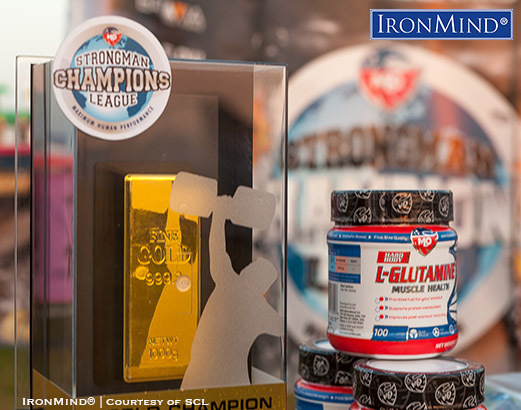 “Besides this great show and strong performance from all the athletes, the Strongman Champions League also launched its new sponsor, MLO Nutrition. “MLO Nutrition is a supplement company that has combined the best from all sports in different lines. “MLO International LLC has decades of experience in the field of health and sports nutrition and modes of training and competition preparation in the areas of fitness, bodybuilding, powerlifting, strongmen, competitive weightlifting and athletics. 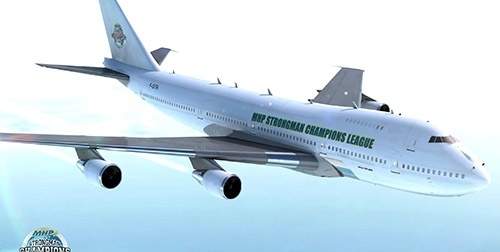 Therefore SCL will be named as the MLO Strongman Champions League, and we hope it will be a long and good marriage with our new head sponsor! “Matjaz Belsak is now the new Leader in the MLO Strongman Champions League, followed by Dainis Zageris , J-F Caron and Krzysztof Radzikowski. 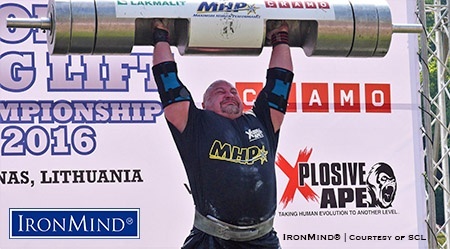 “Next stage nr 7: SCL BULGARIA and this will gone happen in Plovdiv at 23/24 July, so stay tuned here on IronMind for the results, or watch us live at www.strongmanworldseries.com,” Mostert said. 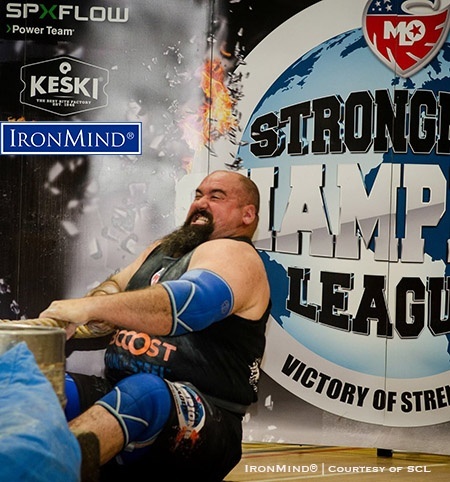 Eric Dawson (USA) didn’t waste any time in his first appearance in the MHP Strongman Champions League (SCL)—he knocked it out of the park and claimed his first SCL victory. Stage four of the MHP Strongman Champions League in Holland was the 100th competition in SCL for Marcel Mostert and Ilkka Kunnen. This epic competition came with quite a few surprises. The newcomer, Eric Dawson (USA), competed in his first Strongman Champions League and shocked everyone to take the win. With 14 strongmen from all over the world, Eric left quite an impression. This year’s competition saw numerous injuries from the original line-up preventing them from competing. Nevertheless, the field was strong and the capacity-filled audience kept the athletes battling to the finish. The first event was the truck pull with only a harness. The initial start of the Truck Pull was tough requiring full power to get the first centimeters of motion. Eric Dawson took first with 33.98 seconds. Alex Moonen was a close second with 35.31 seconds and Holland’s strongest man, Jitse Kramer, took third with 38.35 seconds. Event two was the Giant Dumbbell. With 90kg, the athletes found their rhythm and made it look easy. Each athlete had their own technique for this event. As the dumbbell fell to the ground with a resounding thud, it was an impressive reminder of the sheer weight being moved with one arm. In the last seconds, Eric Dawson, completed ten reps to take the win. Alex Moonen, Marius Lalas, and Aaron Page all finished the event with nine reps. Event three was the Front Hold. With 15kg in each hand, this weight became excruciating as athletes worked through their muscles shaking to hold just a few more seconds. With his impressive shoulder strength, Bjorn Andre Solving won this event with 50.07 seconds while Alex Moonen and Grzegorz Szymański finished with 41.56 seconds. The fourth event was a unique loading race that took athletes to their limits. Athletes were required to load two 100kg textile rolls into a metal frame and then pulling that frame to the finish line. The intense combination of both strength and cardio kept six athletes from finishing. Impressively Jitse Kramer was first with 1:07, Eric Dawson took second with 1:08 and Dainis Zagaris completed the course with 1:10. The fifth event of the day was the Tire Flip. Eight flips in total. 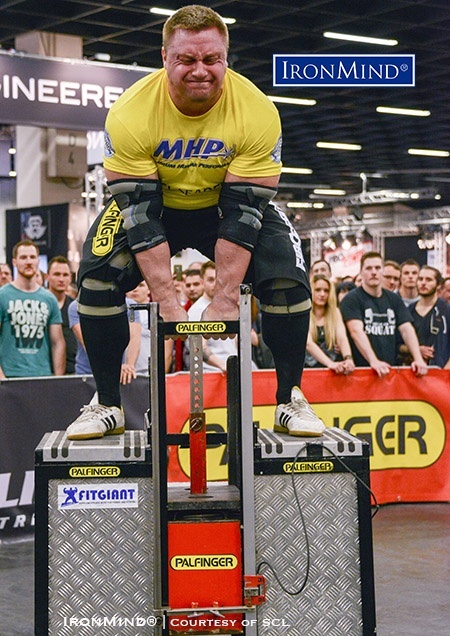 Once again Holland’s strongest man, Jitse Kramer, won this event finishing in a lighting fast 30.27 seconds. Second place was another Hollander Enzo Tauro who finished in 33.70 seconds. Third place in this event was Marius Lalas completing in 33.97 seconds. At the end of the fifth event, Eric Dawson had only a one point lead over Alex Moonen. The Atlas Stones would determine the day’s winner. With the stones ranging in weight from 120kg to 180kg, the greatest challenge of this event was the varying heights. The first platform was taller than many of the athletes themselves. Jitse Kramer impressively won this event with 23.62 seconds. JF Caron completed the course in 25.59 and Eric Dawson took third in the event with 25.94 seconds. His placement secured his first Strongman Champions League win. After the competition, I sat down with both Eric Dawson and Alex Moonen to talk about the day’s competition. Mastodons in Holland: Coming Saturday! “Mastodons in Holland: Coming Saturday,” SCL Director Marcel Mostert told IronMind today. 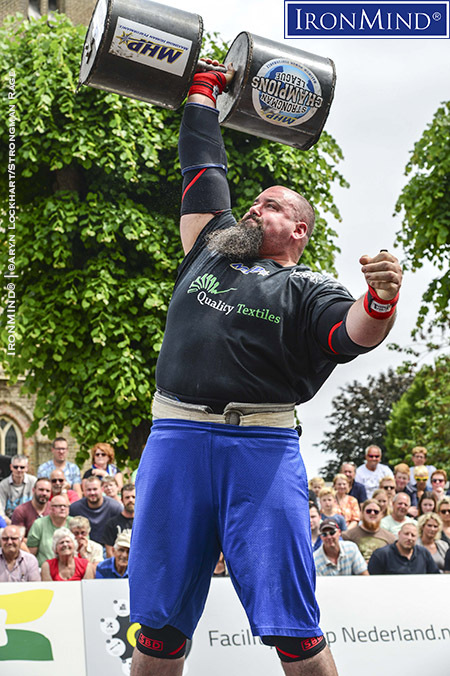 Part of the 16-stage MHP Strongman Champions League (SCL) series, SCL Holland is slated for this coming Saturday (June 11) at 13.30 in Zelhem, Holland, so if you want to see the big and the strong, this is the place to be. With Krszysztof Radzikowski injured, Canadian strongman start J-F Caron will wear the yellow leader shirt, Mostert said. “Maybe Gregorz Shymanski will be the only one who takes the title in a row like the big Z?,” said Mostert. “Watch it live in Holland, or on their On Demand channel at 14.00 hours.” And speaking of TV coverage, Mostert said that SCL contests are broadcast in 95 countries, worldwide. When a last minute injury caused Zydrunas Savickas to withdraw from the 2016 Log Lift World Championships, Vidas Blekaitis (Lithuania) and Robert Kerney (USA) seized the opportunity. 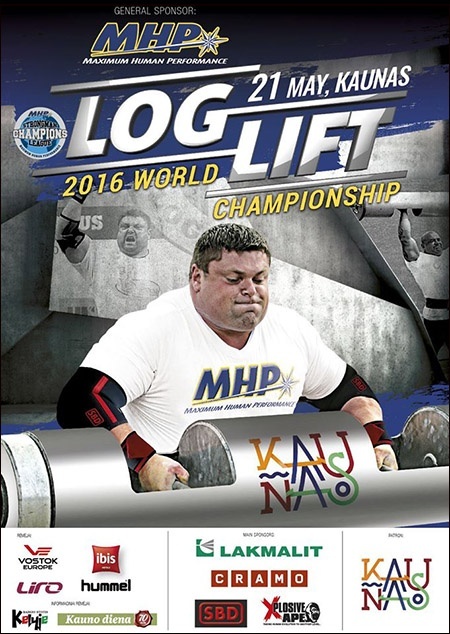 Vidas Blekaitis and newcomer Robert Kearney from the USA won the MHP/SCL Log Lift World’s 2016. In a very nice sunny day in Kaunas, with a great stadium and a fantastic cheering audience, it was these two men who caused a sensation: With both hitting 202.5 kg, they shared first place after 4 attempts. Vytautas Lalas (Lituania) could have ruined their party with an almost good lift on 205 kg. He was very close. Marcos Ferrari from Brazil made a new national Brazilian record with 182.5 kg. Patrick Baboumian ripped his right tricep after he tried 180 kg. Zydrunas Savickas injured himself just before, with a muscle in his neck. He expects it will be recovered soon. Therefore he could not compete, which was of course a pity for the world record holder, but for the contest of course it was very excited to see who would be number 1 in this crazy log lift battle and the 3rd stage of the MHP Strongman Champions League was again a hard one. The next stage will be 11 June in Holland, with stars as Vytautas Lalas, J-F Caron and Gregorsz Szymanski and Dainis Zageris at the start. 15 athletes will be there in a total over 6 events. It promises to be a great battle again, so stay tuned! 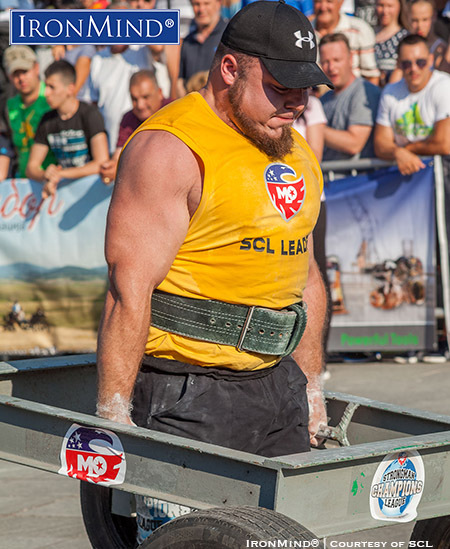 The 2016 SCL Log Lift World Championships are tomorrow, May 21, and there is every expectation that the King of the Log Lift, Zydrunas Savickas, will once again deliver a new world record. 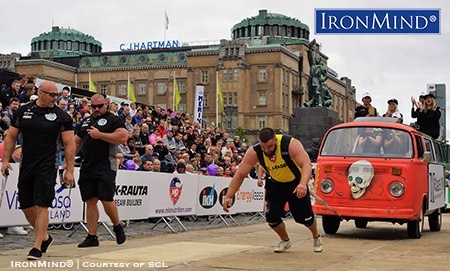 Live broadcasting and a field filled with impressive strongman athletes, “will make this world championships one of the most spectacular log lift worlds ever,” SCL director Marcel Mostert told IronMind. The live broadcast is at 12.00 CET. It was a battle to the end, but Krzystof Radzikowski edged out Matjaž Belšak on count back to claim victory at the Strongman Champions League-FIBO. On Saturday, for the second time in a row, Krzysztof Radzikowski won the MHP Strongman Champions League FIBO held in Cologne, Germany. And for the second time in a row, to Matjaž Belšak’s disappointment, he took second place. In a fast-paced, heavy competition Radzikowski and Belšak went down to the wire finishing the competition with the exact same points (65.5). It was only because Radzikowski won two events that he was able to take the win. This year’s competition, held at the largest fitness expo in the world, was witness to a new world record in frame carry and JF Caron tying the record for the axle deadlift held by Zydrunas Savickas. The legendary Heinz Ollesch (12x Germany’s Strongest Man) hosted the tenth Strongman ClassX. With some of the best equipment in the strongman world, the stage was set for battle and 14 athletes from around the world were ready to get the second stage of the MHP Strongman Champions League underway. The day began with the Conan’s Wheel. With 460kg (1,012lbs) pressing down and making breathing excruciating with every step. Andreas Altmann and Matjaž Belšak tied for first place with 1,120 degrees. Round and round they go. Third place in this event went to Dainis Zagaris far behind with 830 degrees. Event two was the Giant Log. This log is larger than the standard log. It is 36cm wide and three meters long. With no surprises, Radzikowski won this event with 200kg (440lbs). He dared to break his world record from last year, with 207.5kg (456.5lbs), but just barely fell short unable to lock out his right arm. His 206kg (453.2lbs) world record would stand for another year. Second in this event was Dainis Zagaris with 190kg (418lbs) and Matjaž Belšak with 180kg (396lbs). Event three was a 300kg (660lbs) frame for distance. Martin Wildauer previously held this world record with 60m. Grip strength and endurance are the keys to this event. This field of athletes had some of the best grips in the world. First place with a new world record was Stoyan Todorchev from Bulgaria. He won the event smashing Wildauer’s record with 80m (262ft). Stoyan is hard to beat when he’s carrying any kind of weight. He takes off with lightening speed and just keeps going. Second in this event was Cestmir Sima from the Czech Republic far behind with 55.30m (181.5ft) and third came from the giant newcomer from Ireland who stands over 2.1m (6’10”)tall, Sean O’Hagen with 51.15m (168ft). Event four was the front hold. With 30kg (66lbs) outstretched in front of the athletes, there is no question, the front hold is one intense power event. Krzysztof won this event with 43.80 seconds. Andreas Altmann placed second with 42.04 seconds and Raffael Gordzielik from Germany took third with 41.60 seconds. The fifth event before heading to the main stage was the atlas stones ranging from 140kg-180kg (308-396lbs). Last year Matjaž Belšak smashed the long standing record on these stones. This year he won the event with 20.59 seconds, but didn’t quite break his record. He was just under a second slower. JF Caron took second in this event with 23.03 seconds. Stoyan Todorchev took third with 24.81 seconds. JF Caron was finally starting to get into the groove. He had horrible travel challenges to get to the FIBO. While Germany was breaking into spring, Caron was dealing with winter storms and delays leaving Canada that left him traveling 32 hours to finally arrive at the FIBO on the morning of the competition. Without any rest, he was tapping into all of his reserves and still performing impressively. Despite his travel woes, he was still motivated throughout the day. In true strongman spirit, after Caron completed the event, he turned to support Raffael Gordzielik. As Gordzielik struggled with his final atlas stone, Caron offered tacky from his own arm helping Rafael to complete the event. The final event was the 350kg (770lbs) axle deadlift. Heinz Ollesch explained what makes this event so difficult is that the bar does not bend which means you are moving 350kg the moment you pull. After learning of Caron’s travel challenges, it was unbelievable to watch him take the stage and knock out 11 reps as if it were nothing. With this amazing performance, he won the event and tied Zydrunas Savickas’ record. Four athletes took second with eight reps to split second place. Zagaris, Todorchev, Belšak and Radzikowski. Belšak and Radzikowski entered the event tied with 54 points. Since they completed the same number of reps, they ended competition with the exact same points. It was only because Radzikowski won both the front hold and the log lift that he was able to take first overall. Belšak had to settle for second place again. He could not have come closer to a win. When I asked if he was disappointed, his response was, “Ervin Katona told me he came in second place eight times before winning his first SCL. It will come.” He went on to explain he is hopeful he will take his first win this year. The strongman season is just beginning to head into full swing. The third stage is up next on 21 May for the World Log Championship in Lithuania. The season promises to be exciting with new locations for MHP Strongman Champions League throughout the world. We’ve only completed stage two and already, JF Caron has lost the leader shirt and Radzikowski is back in the lead. Don’t think SCL has been sleeping since their last contest—things have been busy behind the scenes and this weekend SCL will be part of the FIBO 2016, the world’s largest fitness expo, SCL director Marcel Mostert told IronMind. “FIBO, in Cologne, is 4 days long, 12 buildings full of action and the biggest stars in the house, with all sports, 250,000 visitors and the 2nd stage of the MHP Strongman Champions League. “It will be exciting and madness again: Last year Krzysztof Radzikowski broke the world record of Zydrunas Savickas on the World’s biggest log and he is planning to break his own record again this year. Let me just say, the man is in shape,” said Mostert. SCL Giant Log for max weight, the biggest log in the world. 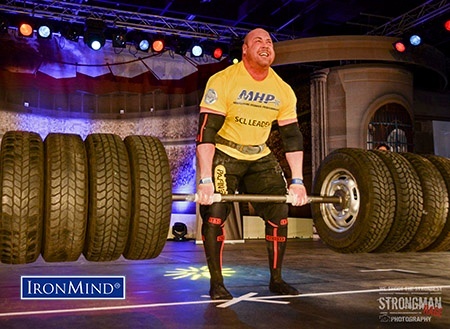 “We are proud to present again another 16 stages from the MHP Strongman Champions League this year,” SCL Director Marcel Mostert told IronMind today.Broadcasting on a worldwide platform of 95 countries and with a 100 strongmen competing we can be truly called the World’s Strongest League. “A new scoring system will be introduced this year: the new world champion will be crowned solely based on stage 16, so everybody will have to fight to the bitter end.Besides of the fame and worldwide publicity the MHP Strongman Champions League has, we can be seen also as the absolute start-up and educational center for new champions, talents and professionalism,” continued Mostert.Athletes such as Krzysztof Radzikowski, Hafthor Bjornsson, Matjaz Belsak , J-F Caron and Martin Wildauer for example—they all got their first biggest international wins in the MHP Strongman Champions League. “Besides of our league, we are also organizing and co-organizing a lot of small national competitions, team competitions and specials such as the World Log Lift Championships on 20 May in Lithuania, together with Mr.Strength himself, Zydrunas Savickas, who told me that he wants to set a new world record there, which should be enough for the coming 10 years! That is pure excitement and we can’t wait until the 20th of May. “But first we going to do the 2nd stage of the MHP Strongman Champions League. “Also, have a look at our latest trailer, just released, with the highlights of the 2015 season, and and stay tuned for more news about each competition on our media platform, our website and IronMind in particular,” said Mostert. Canadian strongman Jean-Francois Caron kicked off the new year with a huge win as he was crowned World’s Strongest Viking 2016 at SCL Norway. 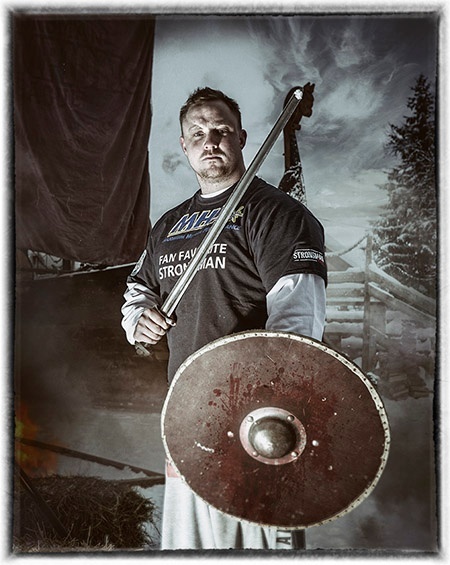 Up in the mountains above the little village of Vinstra, placed in the beautiful valley of Gudbrandsdalen, MHP Strongman Champions League Norway – World’s Strongest Viking 2016 was held January 29th and 30th. This was the first stage of the MHP Strongman Champions League 2016. In total, there will be 16 stages throughout the whole year, broadcasted in 95 countries, to crown the ultimate world champion at the end. The venue is, as it was last year, Fefor High Mountain Hotel, a hotel whose walls are filled with history of poets and kings, and an atmosphere unlike anything else. The owner of the hotel, Anne Grethe Horten, has a dream of building the ultimate strongman arena for both national and international competitions, and so far, she is on the right track. All the equipment are made with Viking as a theme, and with a Viking village as a backdrop this competition is something different from what you find anywhere else in the world. Both athletes and audience was promised a cold experience up in the mountains, but little did the crew, arranging this competition, knew that the Norse gods of weather had other plans. They planned that a hurricane named Thor would ravage Norway this weekend, making this winter wonderland a dangerous place to be. With heavy snow as well as wind, first event was changed from Hercules Hold to front hold. This was considered a less dangerous event than the original. At 8.00 PM, a young Viking girl opened the competition by blowing her horn, Vikings with shields and weapons were surrounding the competition arena, and the first two athletes were ready for action. A tough event became even tougher with snow blowing in the faces of the athletes, but the men were tough, and toughest of them all were Bjorn Andre Solvang, who stood for 66, 26 seconds. After this first event, both Vikings and athletes took refuge inside while the crew got the arena ready for next day’s big competition. Weather was a theme during almost every conversation that night, athletes hoping for better weather to compete in, Vikings hoping for less wind so their tents wouldn’t fly away. When everybody was inside the hotel, the MC of the weekend, Magnús Ver Magnússon, invited to a seminar about his life and his view of training and competing. It was a very interesting hour for all fifty in his audience. Saturday dawned, with sunshine and less wind that the night before. In the restaurant, the athletes were eating their breakfast number one and two, on the arena the crew was finishing the last few details for the competition. At 11.00 AM, the Vikings started to beat their drums, followed up by the same young Viking girl blowing her horn. Viking warriors ran roaring on to the arena, beating their shields with swords and axes and the competition was declared open. First event was Viking longboat pull. A Viking longboat was to be pulled as fast as possible 20 meters. The boat itself wasn’t very heavy, but with a weighed down sleigh that froze to the ground in between each competitor the event was more than hard enough this cold winter day. All athletes struggled with the start of the pull – except Matjaz Belsak. According to Krzysztof Radzikowski he had “spikes that he could climb Mount Everest with …“ Matjaz exploded from the start and sprinted the boat over the finish line, winning the event. Next event was Hercules Hold. This piece of equipment was built for last year’s competition, and looks even more awesome this year after standing outside in wind and weather. Each log weighed 150 kg in the hand, and in wind that makes the temperature even lower than it actually was, this was going to be a very tough event. The first three or four athletes really struggled with finding the balance on the platform, so they lasted for very few seconds. The fastest time of them all had Aaron Page from England, with 1,7 second. He wasn’t too happy with that result, but still; a record is a record … The winner of the event was JF Caron from Canada, who lasted 55,92 seconds in the freezing cold. In between events two and three, there was supposed to be a break, but because of the weather and the light, crew and TV-crew decided to go on. The athletes where happy for that decision, knowing that they would be able to get inside sooner than expected, so they gave it all for the last three events. Powerstairs was the third event. This awesome event was built for this year’s competition, and the weights was cast at a casthouse further south in the county. Three weights, weighing 185, 195 and 205 kg was to be lifted as fast as possible up four stairs, the athletes going in pairs. The crew was afraid that the weights would be too light for the athletes, but it turned out that the weights were just fine in these weather conditions. The big Swede, Johan Espenkrona, had injured his back three weeks before the competition, so he had to give in after two implements. The winner of the event was Krzysztof Radzikowski from Poland who did all three implements in 23,09 seconds. Second to last event was Viking press. This big wooden equipment built to last year’s competition by the hotel’s own carpenter weighed 160 kg in the hands, and the athletes had to go out in pairs. The Norwegian Vikings and audience had big hopes for Bjorn Andre Solvang, who is an excellent presser. The part of the audience that cheered for mr. Page from England hoped that he would find his revenge in this event, since his major strength is pressing as well. Aaron ended up on 13 reps, and a joint 3rd place with Dainis Zargeris from Latvia. Both Matjaz and Krzysztof ended up on 15 reps, and the winner of the event was Norway’s own Bjorn Andre with 19 reps. The last event was the event Krzysztof had dreaded the most. For weeks he had been complaining about lifting atlas stones in the cold weather, he was sure no tacky would hold the cold weather, that no stones would be lifted … so when Jorgen Skaug Aukland, the Norwegian 105-strongman, did 4 stones, Krzysztof sighed and opened his box of tacky. It turned out that Krzysztof was right; it was difficult to find the right kind of tacky. For all the athletes the two or three first stones went up easily, but after that the tacky froze and the stones became close to impossible to lift. The only one who managed to get up all five of them was JF Caron – who with that fifth stone could call himself World’s Strongest Viking 2016. 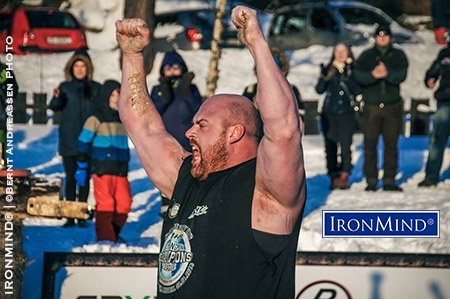 SCL is set to launch its 2016 season at the Fefor High Mountain Hotel in Vinstra, Norway this coming weekend—temperatures are expected to dip down to about -30C/-22F so everyone who thinks strongman is a winter sport would say that contest conditions will be perfect. Up in the mountains above the little village of Vinstra, placed in the beautiful valley of Gudbrandsdalen, SCL Norway–World’s Strongest Viking 2016 will be held January 30th. It is the first stage from the MHP Strongman Champions League 2016. In total there will be 16 stages again throughout the whole year, broadcast in 95 countries, to crown the ultimate world champion at the end. The venue is, as it was last year, Fefor High Mountain Hotel, a hotel whose walls are filled with history of poets and kings, and an atmosphere unlike anything else. Twelve of the strongest men in the Northern Hemisphere will compete in a total of six events, where the first event will be held Friday at 8:00 PM. According to the weather forecast, it will be very cold at Fefor this last weekend of January, down to -30C/-22F, so this battle of finding out who is the strongest Viking in the world will be tougher than ever. where ice and snow, along with abundant natural beauty, will greet the strongman competitors. 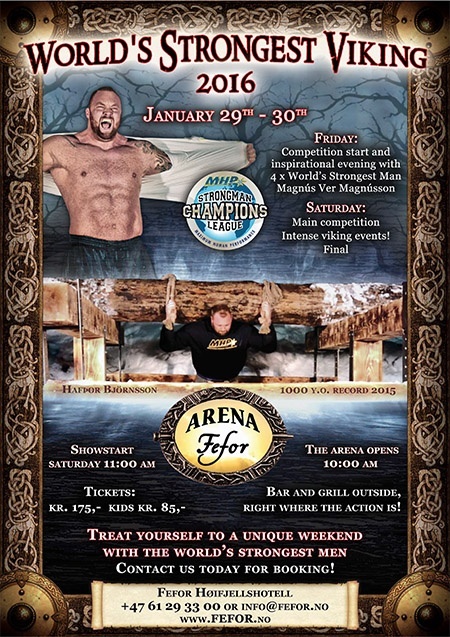 Strongman Champions League kicks off its 2016 season with the World’s Strongest Viking in Fefor, Norway January 29–30. Remember what happened here last year, when SCL brought some of the biggest names on the professional strongman circuit to this winter wonderland: among other things, the primal power of Hafthor Julius Bjornsson was unleashed on a massive log and his feat of strength went viral.Mark your calendar and stay tuned to IronMind for more details.